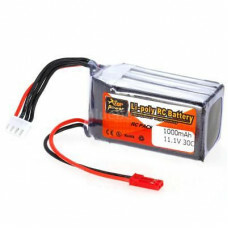 11.1V 1000mAH Lipo battery is Capable of maximum continuous discharge rates up to 30C, placing this battery among the most powerful Li-Po battery packs in its class! It offers an excellent blend of weight, power and performance. It has a 30C Burst Rate & 1000Mah Storage. 11.1V high power and 1000mAh high capacity. 30C high discharge rate provides more power. Stable output current, protect your RC drone. Sustaining high rate discharge and durable in use.